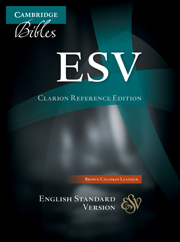 The English Standard Version is a literal translation from the original Bible texts, firmly rooted in the tradition of Tyndale and King James but without their archaic language. First published in 2001, it is closest in style to the Revised Standard Version and is well suited to public reading and memorization. 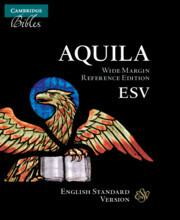 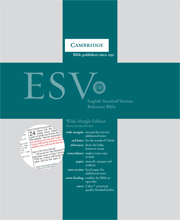 The ESV is the latest Bible version to appear in Cambridge's special wide-margin format. 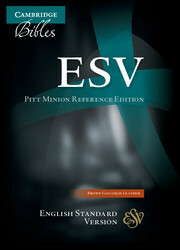 The ESV Wide-Margin Reference Bible is an enlargement of Cambridge's ESV Pitt Minion Bible. 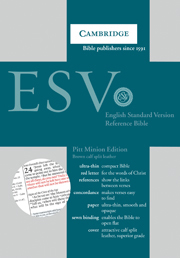 The text arrangement and pagination of the Bible text are identical but this e is an dition uses enlarged text, has wide margins for personal notes and is printed on paper that stands up well to note-taking. Another bonus for bible study is a more extensive concordance. 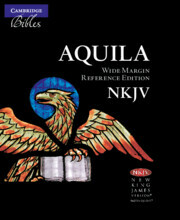 This Bible has red-letter text for the words of Christ and includes cross-references, a concordance and maps. 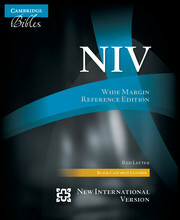 It is bound in dark brown bonded leather with two ribbon markers. 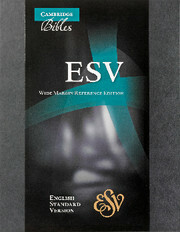 Like all Cambridge Bibles, it is Smyth-sewn for durability and ease of use.